Bido gives every Bido member the opportunity to have a share in the sales proceeds. 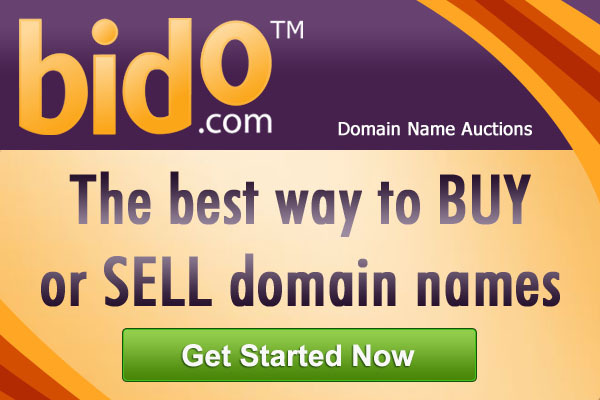 Start today earning additional income by just copying and pasting one of the banner codes below to somewhere on your Websites and blogs, by posting customized links to auctions on twitter and facebook, or by letting prospect buyers of specific domains listed on Bido know about the auction (e.g. by sending them an email with a customized auction link or a banner code in it). To get a customized banner for a specific auction, you may add &name=Example.com to the link in any of the banners below (Just replace Example.com with the name of your domain). To get a customized banner for all of your own auctions, you may add &p=NICKNAME to the link in any of the banners below (Just replace NICKNAME with your own nick name on Bido), and the banner will display only your auctions. To generate affiliate earnings, you may customize the banner by replacing 0000 with your own affiliate code. To get your affiliate code, please click here. For more infos on how to earn money by promoting domains, please click here. Promote Bido, and receive all types of affiliate commissions (bidding, submissions, new affiliates) where bidders, sellers or affiliates were referred to Bido over your links.